On Tuesday 22nd Feb I met up with the lovely Natalie from Koh Phangan. It was brilliant and we had some lunch and caught up on the last 5 months really. Where does time go? I bought some drugs for my foot and also an ankle support (which I later accidently left with Nat) We went for a wander down Queen Street as I wanted to get some prices for my trip, I had spotted a sale on my tour online so I was keen to sort out my travel plans. We took a few pictures and walked up to the clock on Queen street. On the way back we popped into STA to get some quotes for a car. 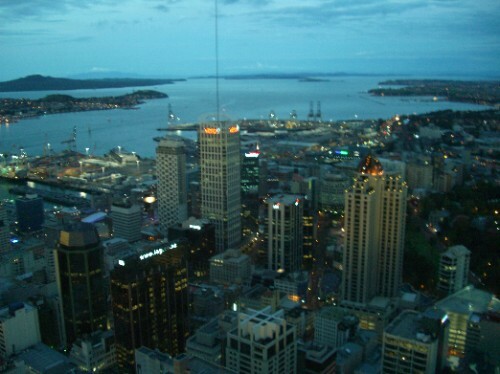 We had discussed hiring a car and doing the Bay of Islands in my last few days in Auckland. We had a nice girl from England and agreed $430 to do the Jill pass with Stray so I was happy. It would take me to some stops then down to Wellington then back up to Auckland. The next set of news was to shock me though. Reports were coming through when we were in there that there was a terrible earthquake which was a lot worse then the first one in September. I think between us and the STA staff we were in shock especially as I had only left there the day before. There were no news on fatalities but we knew it was serious as a lot of buildings had collapsed. I booked my trip and said bye to Nat and headed back to the hostel. News was filtering out about the extent of the damage and it was so sad. I logged on online and saw one of the guys I met in the hostel in Christchurch was ok and safe, thank god. I really hoped my other friends were ok as well as we were so close to the centre. He had posted some pics of our hostel which had half collapsed as well. I had messages filtering through so I changed my status to let everyone know I was safe and sound. I met up with Sylbert from back home later on that night and we went to Degree and had a catch up on life and work and our trips. The news was on in the background and I was glued to it as well. I will not lie I was totally freaked out watching it and seeing the devastation and all the people that had died in it. It just made me think alot. When I was back in Sydney I was debating whether to fly on the Monday or Tuesday out of CC. Luckily I opted for the Monday but I couldn't help but wonder what if? I know you should not do it but to be that close to such a devastating event was really scary. Also with the dodgy foot, had I not booked that flight then I would have been there and who knows. I do feel like I have been lucky and someone is watching over me as I was not to far away from the Australia floods, its like they are always behind me. But my heart really goes out of all the people of Christchurch and surrounding areas. Driving through it you could see the ruins from the first one so this was going to be even harder to recover from and in the first no one had died. I guess it just makes you realise even more how precious life is and how quickly it can all change. You have to enjoy every second of it. I like to think I live by that philisophy anyway but it really does drum it in to you. Me and Sylbo shared a beautfiul fish platter and a few beers (cheers Sylbo for spoiling me) and we went to a bar with a live band. Later on we both headed home but it was awesome to see him. The next day I was booked on the Stray orientation pass which takes you around the city for free to some of the sights. I really wanted to do something as the foot was driving me crazy and I wanted to check out the city. It took us to the Skytower, where a girl got a free jump off it (lucky cow) it is a more controlled jump and you only go at 70kmph. Then on to the habour area which I had been the night before with Sylbo. We then made a stop at Speights brewery for lunch. After lunch we went to Mount Eden which is a volcano and overlooks the city and told me I am about 18,000km from London. It was also a Maori ground (Bastion point) a long time ago as they could see any other tribes that were attempting to come and invade. We alos looked out into the habour and could see some of the other volcanoes. There are about 20 volcanoes in Auckland. The most outstanding are Mount Eden and One Tree Hill where Kiwi Tamaki ruled from until 1750. After this we headed to the Auckland bungee bridge where everyone could climb part of it and a few people did 40metre bungees. I was not allowed to go as it was a bit of a walk out. To say I was guttered was an understatement. DAMN ANKLE/FOOT!! There was a girl there who had hurt her foot a few days prior. Her story was a lot more fun then mine but her injury was a lot more serious. She had torn some ligament or tendon between the achielles and fibra or something.. OUCH!! Anyway after all this we headed back to the hostel and I did some food shopping with 2 of the girls in my room ready for the start of touring the north island.